I find myself going back to this video every now and then. It was my introduction to Carl Sagan, but it also did much more than that. The Pale Blue Dot, Sagan's masterful book about the place of humans in the universe, changed my life. It made me look very differently at the world and our place in it. Just something I wanted to share on New Year's Day. "The aggregate of our joy and suffering, thousands of confident religions, ideologies, and economic doctrines, every hunter and forager, every hero and coward, every creator and destroyer of civilization, every king and peasant, every young couple in love, every mother and father, hopeful child, inventor and explorer, every teacher of morals, every corrupt politician, every superstar, every supreme leader, every saint and sinner in the history of our species lived there – on a mote of dust suspended in a sunbeam." 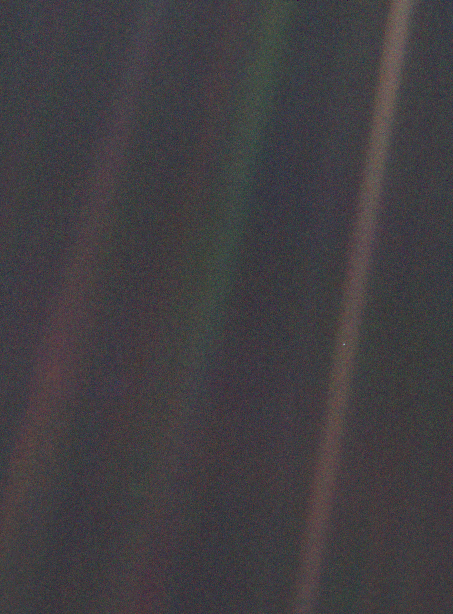 This is the 'mote of dust suspended in a sunbeam'; planet earth photographed on Valentine's Day 1990, from 6 billion kilometers away by Voyager 1 (now the farthest man-made object in the universe). Look very carefully, you'll see it. "Think of the rivers of blood spilled by all those generals and emperors so that in glory and triumph they could become the momentary masters of a fraction of a dot. Think of the endless cruelties visited by the inhabitants of one corner of this pixel on the scarcely distinguishable inhabitants of some other corner. How frequent their misunderstandings, how eager they are to kill one another, how fervent their hatreds. Our posturings, our imagined self-importance, the delusion that we have some privileged position in the universe, are challenged by this point of pale light." Watch Sagan narrate those words, set to some beautiful music and unforgettable scenes from all-time great movies. My name is Mrs Sharon Sim. I live in Singapore and i am a happy woman today? and i told my self that any lender that rescue my family from our poor situation, i will refer any person that is looking for loan to him, he gave me happiness to me and my family, i was in need of a loan of S$250,000.00 to start my life all over as i am a single mother with 3 kids I met this honest and GOD fearing man loan lender that help me with a loan of S$250,000.00 SG. Dollar, he is a GOD fearing man, if you are in need of loan and you will pay back the loan please contact him tell him that is Mrs Sharon, that refer you to him. contact DrJubrin Mohamed Email:(abubakarloanservice@gmail.com) Thank you.